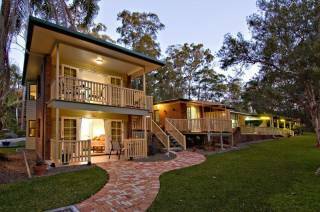 Set on a peaceful rural garden setting.10mins from Australia Zoo. 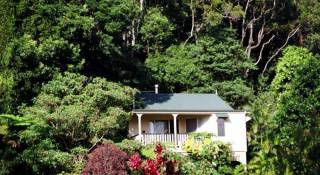 Poppies B&B has modern independent private suites, very close to all Sunshine Coast's attractions. Your own entry and decks means you can come and go as you please. A place to relax. 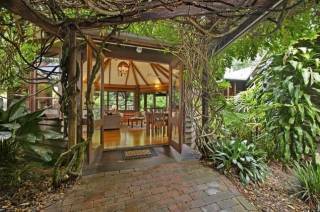 Frangipani House is an exotic fairytale house set by an enchanted forest. Relax amidst fascinating curios, sleep in starry romance, frolic in a tropical hot-tub jacuzzi, enjoy a fabulous outdoor entertainment area. Jacaranda Cottage is a lovers retreat, full of the charm of yesteryear... ideal country getaway with cosy winter fire for chilly nights, exotic hot-tub jacuzzi-spa, & fabulous swimming pool to cool off on hot summer days. 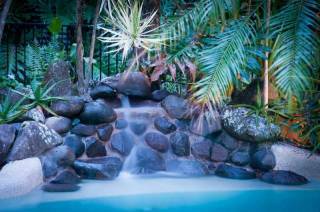 Relax in a warm, bubbling spa. Light the wood fire. Sip your favourite wine. 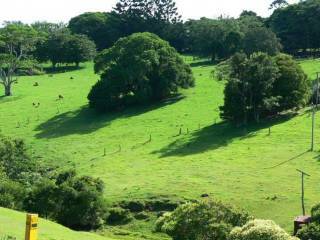 Gaze out on a magnificent vista of rainforest & pastures. 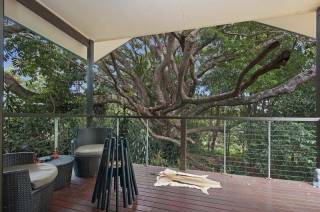 Recline on your private deck listening to the birds. Paddle in the private creek. 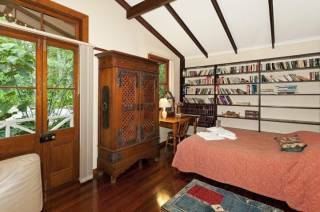 Cape Cottage (Kaapse Huisie) is a cosy cottage for two under our 500 year old figtree, with the branches of the tree hugging the cottage! Like being in a tree house! The "Rondawel" is fully self contained with a beautiful large glass and timber living area, two hexagonal bedrooms and a fantastic bath overlooking the fragrant gardens. 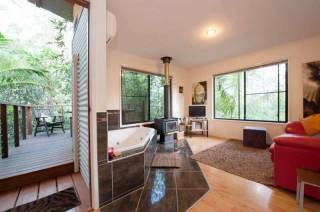 Relax by the log fire in winter, or enjoy cool summer breezes in summer. 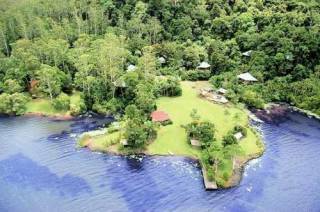 Beautiful Hinterland resort comprising 10 apartments and 3 cottages all self contained. 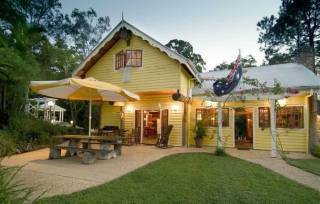 Situated on the main road 2 kms from Montville heading towards Maleny. 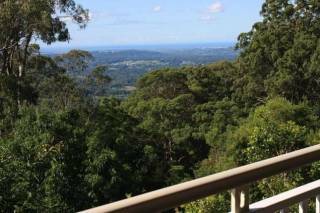 Perched on the escarpment with 180° views of the hinterland and the Sunshine Coast. 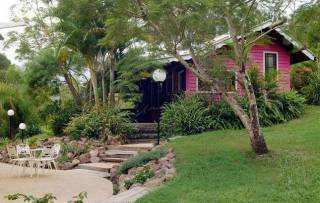 The luxuriously appointed cottages have been designed for romance & rejuvenation. Unwind in the double spa with magnificent views to the coast. 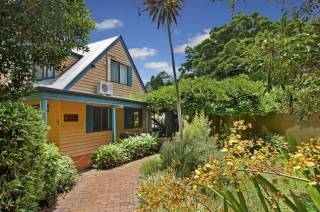 Alaya Escape is a beautiful Bali-inspired B & B retreat with self-contained bungalow accommodation situated close to the Sunshine Coast villages of Montville and Maleny, as well as the beaches of Mooloolaba, Noosa and Coolum.Come and Feel the Difference! You will fall in love with this dream destination, as you slip into the bubbles of the sunken spa and gaze at the stunning lake views. Cosy up together in front of log fires or delight in an in-house massage - spoil yourself and your partner. 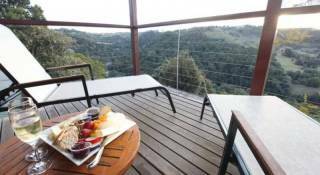 Nestled in the shadow of the rainforest and adjacent to lush, rolling hills, our accommodation is private, secluded and is an idyllic retreat for those seeking relaxation in luxury surrounds. Relax, rejuvinate and rekindle romance. Step into another world & unwind in an Egyptian inspired suite nestled on a quiet hillside with breath-taking views. Specially designed for a mystical pampering nurturing experience. We offer massage & other relaxing treatments & room service.